Randy’s Blog: It’s Fall Already? Well, we’ve had an amazing summer of warm weather and sunshine for most of Ontario, and I hope everyone has been able to make the most of their outdoor activities and managed to put some of their hard work at Focus to good use outside. Part of the underlying philosophy at Focus is that personal training sessions and group sessions are all designed to enable members to put their strength, endurance, and flexibility to work for them in everyday settings. The summer is often a time where hikes, rides, and vacations seem to have all of those elements combined in one outing – at least the good vacations do. As we age, our ability to draw on that muscle memory to get up and go gets harder. It’s almost like we have a bank that we need to keep making deposits into, so that when we want to make a withdrawal, the energy is there. The summer is also a time where schedules become difficult to adhere to. It’s Okay, we live in Canada and we should celebrate the great weather and go out and enjoy it, but now that summer is ending (don’t shoot the messenger!) our schedules are getting back to normal. Routine is a good thing for our bodies. Routine does not have to mean boring, though. This fall we have made some changes to our group schedules. One class in particular: Focus on Bones, which is every Tuesday from 7pm to 8pm. This class is designed for Focus members that are starting to experience some issue as a result of osteoporosis, and have begun to lose muscle mass and bone density. 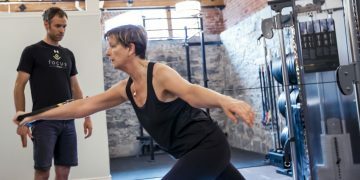 The unique set of exercises with barbells and other resistance materials will help you maximize your strength and fitness as you age. Many people tend to wait a bit too long before addressing these issues. If this sounds of interest to you or anyone you know, give Hope a call at Focus and she can tell you more. As well, look over the new schedule and see if there are any other classes that catch your eye. Classes are a great way of scheduling time for yourself and, also, making a commitment with a friend to attend a weekly class will increase your attendance. If over the summer you found that some activities became harder, or perhaps you picked up a new hobby, it’s a great time to tell your personal trainer about that. Your personal training sessions are a means to your overall fitness goals, so as those goals change, so to should your workouts. Keep you eye open for more group activities, as we get further into fall and winter. One thing we are considering is an indoor cycling group for members that would like to get back into cycling. It would combine some of the fitness aspects of spinning, but with your own bike (no matter what kind) where you can learn about correct cadence and gear changing, along with other practical cycling skills. In the spring I set up a triathlon group for beginners, and we found that many people were most nervous about cycling on the road, but I’m happy to report that everyone overcame those fears with some great coaching and practice. As always, please drop me a line via email and tell me what you think. I love to hear from Focus Members with ideas on how to make improvements.